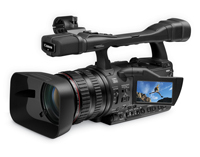 Canon introduced two new prosumer HD camcorders that will be available December 8. The XH A1S and XH G1S HD have improved upon image control, quality and audio capabilities. Both cameras are extensions of the higher end XL-H1 HDV and give the serious professional and amateur videographer a more economical solution. Both new HD cameras come with a Canon 20X High-Definition fluorite lens which has three independent manual adjustment rings for focus, zoom and exposure. The cameras also come with 3 high quality 1/3″ Native 16:9 CCDs at 1440 x 1080i resolution. The cameras can record on HDV tape or miniDV which allows over an hour of high definition footage. A fold-out 2.8″ LCD (207,000 pixel) monitor allows easy viewing while filming. You also have a choice of filming in 1080i/60i, 1080i/30f or 1080i/24f mode. Impressive audio improvements on both cameras include: two-channel audio performance; two built-in XLR terminals with separate audio-input sensitivity settings; and, the ability to simultaneously record sound from the supplied internal microphone and an external microphone. The difference between the two cameras can be found in the more industry equipped (and therefore less of a prosumer camera) XH G1S which provides HD-SDI/SD-SDI Output, SMPTE Timecode Input/Output, and Genlock Input. The Genlock sync will facilitate multi-camera shoots by allowing timecode matching and hassle-free camera switching.